The Fellowship was fortunate enough to obtain a copy of SNOWFALL #1 from Image Comics. Joe Harris writes, Martin Morazzo draws, Kelly Fitzpatrick colors, and Michael David Thomas letters. The corporations have been trying to fix the climate (that they broke, by the way) but they’ve been unsuccessful up to this point. This is certainly a successful first issue, with enough history to pique our interest and enough about Anthony and the Wizard (and the Inspector) to get us ready for some conflict. The art also works wonderfully at bringing the background into focus and into the story. And also those curious eyes. Maybe the White Wizard knows how to do fix the climate – I guess we’ll just have to keep reading to find out. Get on board with this one now. 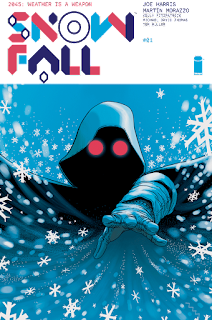 SNOWFALL #1 is available now at your FLCS or at imagecomics.com.